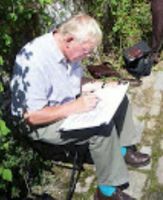 My sketches are done in pencil or pen with the occasional bit of colour quickly applied, usually in quite a loose manner, just to give a bit of feeling to the scene. I always go out sketching with the prime aim of gathering information rather than with the intention of producing a finished piece of work. After the sketch I will usually take a photograph for reference. Quite often I will make a note of colours, tone, the direction of the sun (even if it is cloudy), the name of the location, time of day, date and the weather conditions. For recording tones I use a scale of 1 to 4 where the lightest tone is 1 and the darkest tone is 4. The range of 1 to 4 is a bit limiting so for in between tones I add another half to the number. I find this easier to use compared with a scale of 10. Keeping a record of information such as this is most useful when you decided to do something with it some time in the future. I have a pile of sketchbooks with material recorded in this way and is a readily available source of ideas for artwork I can turn to. This is a better way of recording a scene rather than relying on photographs alone. Photographs are convenient and have their place. It is not very often I use a complete photograph. I find there is often more than one possible artwork in one photo. Making use of this information I then work up ideas in a sketchbook. This approach helps formulate different ideas and possibilities resulting in a higher degree of satisfaction rather than slavishly copying everything on the photo.